Confession time: although I live in them now and did for most of my teenage years, the very first band t-shirt I ever bought was a Blink 182 shirt. It was black, with blue and white graphics of the rabbit on it, and I wore it all the time over a long sleeved white t-shirt with a backwards baseball cap because I genuinely thought Tom Delonge was an absolute bloody fashion icon. To conclude, Blink 182 were an absolutely pivotal band in my teenage years. They were, by miles, my gateway band. I listened to every band they said had influenced them, every band who toured with them, every band who they had a link with, to the point that they were personally responsible for at least like 40% of my iPod. And yet I’ve never actually seen them live! They’re actually one of the last bands left on my music bucket list, and I got to tick this off this weekend. 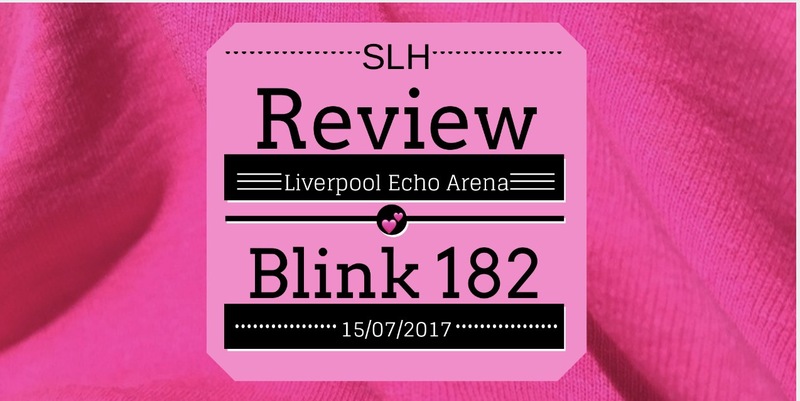 They played my local arena, Liverpool Echo Arena, which is great because I always love a hometown show AND because the Echo Arena now let you pick your tickets up from the box office on the night rather than having to pay for postage on your tickets. Five saved, absolute winner. Although you do have to take the cars you paid with and I paid with a card I’ve since lost so I actually had to take with me printed pages from my online banking showing the purchase, but I’m sure none of you are as daft as me so that’s fine. 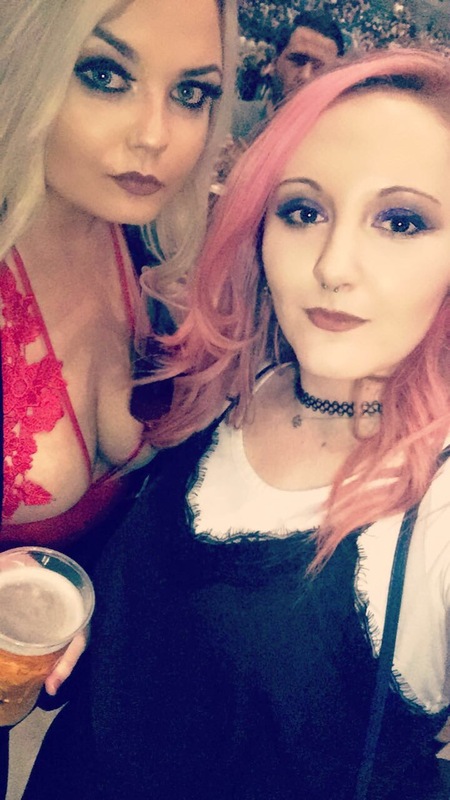 I headed down with my friend Jamie – we were originally going to have some drinks on the Albert Dock but due to problematic issues around wind off the river Mersey and Jamie’s hair extensions we decided to just head into the venue. They have you go into the right door for your seat so it’s all really nice and steam lined, even with the new, additional security measures. I want to take a second here to say a massive THANK YOU to all the fab security staff for keeping us safe and being super nice and efficient with it – they make you feel super at ease which is great. We didn’t make it in time to see the Front Bottoms, sadly, although my friends who got their earlier than me said they were great! So the first act of the night we saw was Frank Turner. I have to be honest, I’ve never heard anything by him before but after a bloody fantastic performance and a fantastic speech about Safe Gigs For Women, I’m an absolute convert and spent most of my day in work today (when not snidely watching Game of Thrones on my iPad) listening to his back catalogue and I’m now a firm fan. Then it was Blink 182 time (although I could have had an extra hour of Frank before they came on tbh) and wow. A proper, high energy, pop punk show, that I always would have expected from them. 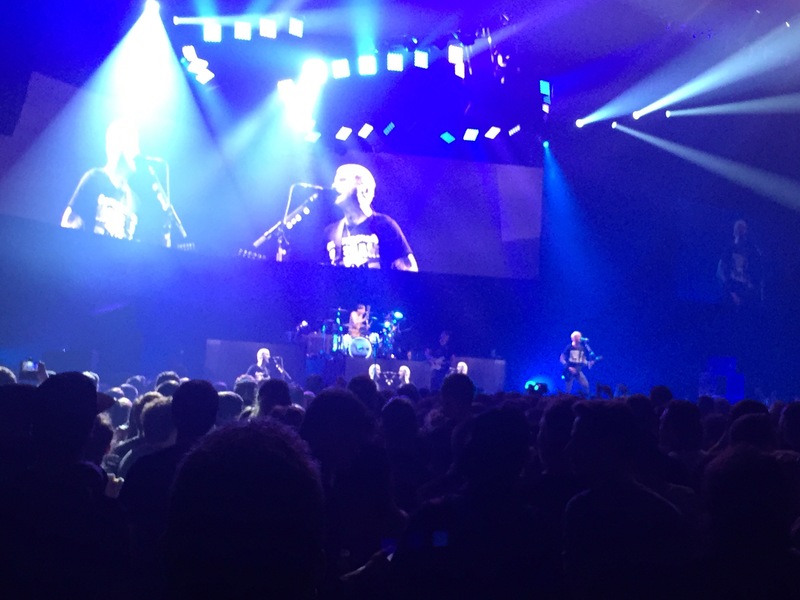 They played all the hits – Rock Show, All the Small Things, First Date, Miss You etc etc and Travis Barker was bloody incredible. I always knew he was basically the best drummer in the game but actually seeing him live (I was close enough to see them in person rather than watch the screens) brought it home in a new way. He’s like super human. Obviously I have to take about the elephant in the band…it wasn’t quite the Blink 182 of my childhood. Tom, as everyone who doesn’t live under a rock knows, left the band a while back under not great circumstances and so Matt Skiba has replaced him. I confess, I wasn’t sure what is think of it all, but I was actually really impressed with this new form of Blink. Mark really stepped up his front man game and absolutely shone and Matt totally owned all the new songs (Sober, Bored to Death day) and was confident enough to put his own spin on the old favourites, rather than just trying to sound like Tom and it all go quite karaoke-esque which is what I was worried about. It was just really, really good and I think it was even better because I hadn’t known what to expect, and that it was different but good was a total winner. A big highlight of the show that I definitely can’t leave out of this review is that Travis brought his son on stage to drum during the encore and it was not only super cute and made me super jealous of the kid for having such a cool parent, it also made me severely depressed that I am no where near as talented as Landon Barker! But yeah, I definitely had a great time at the ‘Rock Show’. Sorry, couldn’t resist!